One of the consequences of the recent collapse of the Soviet Union and the Communist bloc has been a renewed appreciation of the lack of correspondence between the ideology and the practice of socialist revolutionary states. Not surprisingly, this lack of correspondence between the two is nowadays the most serious challenge to the legitimacy of the Cuban state: the central promises of the ideology of the revolution on which the legitimacy of the revolutionary state ultimately rests, the tremendous collective effort of the Cuban people on their prosecution and behalf, and side by side to it the grim reality of widespread inequality, corruption, and impoverishment in the island, aggravated, after years of public administrative mismanagement, by the international isolation of the regime. This context makes an assessment of the reliability of Cuban educational statistics particularly worthwhile. Marxist societies like Cuba consider ideas weapons in the class struggle, stress the function which education has in facilitating the political indoctrination of the population, and value universal education as a way of bringing about social equality (Hollander 1982). Thus, it is appropriate to examine now, in the twilight of this failed experiment, the reliability of Cuban educational statistics. To what extent are they affected by the generalized tendency of these social systems to exaggerate accomplishments and make untenable claims? The question is not gratuitous, for there have been widespread and persistent concerns among social scientists about the reliability and validity of Cuban statistics. Carmelo Mesa-Lago (1969; 1979) was the first to explore these issues for economic statistics. Demographic statistics have been manipulated by the government. Lisandro Pérez (1984) shows how Cuban 1970 Census data on race and education was suppressed by the government for political reasons. Norman Luxenburg (1984) using health statistics, exploited the often-found exaggerations about the achievements of the communist government resulting from the inattention and underestimation of the remarkable progress of pre-1959 Cuban society. Given these uncertainties, we made internal and external reliability checks on Cuba’s educational statistics. The primary source of statistical information used in this report are the educational statistics published by the United Nations and by the Cuban government. UNESCO information on Cuba’s post-1958 increases in student enrollments, the average number of students per teachers, and the proportion of students repeating their grades are good measures of educational changes available for most countries in the world. The Cuban government has tried to increase the number of students, teachers and graduates. These indices have been used repeatedly by Mr. Fidel Castro and other leading members of the government to document the successes of the Cuban revolution and the continued relevance of socialist ideology (Castro 1990b). External reliability criteria used in this analysis come from UNESCO reports. Its yearbooks are the most complete, up-to-date source of educational statistics on Cuba. Moreover, UNESCO statistics are collected from official sources in Cuba and throughout the world using uniform definitions, operationalizations, and procedures. Unlike the problems that arose from comparisons of socialist and capitalist economic indices, UNESCO publishes comparable international educational indices appropriate for this analysis. We did not have access to the procedures used in Cuba to collect educational statistics and lacked the resources to evaluate the accuracy of the educational statistics of the countries in the UNESCO reports. Nor were there sufficient number of reports by independent observers which would provide external validity checks to country-level statistics. Thus, we could not determine the relative accuracy of Cuba’s statistics vis-a-vis specific countries. Instead, our comparisons are less exact. They are based on Cuba’s relative ordinal positions in the distribution of measures of educational achievement by continent (Africa, America, Asia, Europe, Oceania) (see below). Cuba’s relative position in these distributions of national scores provides a criterion of internal consistency to evaluate the reliability of the Cuban data: we expect that most European countries would score higher than Cuba in various dimensions of formal education while Cuba would score higher than most of the countries in the other continents. For reasons of limitations in time and resources, the analysis is restricted to information available from every country included in the UNESCO Statistical Yearbook. This information is used to calculate students-per-teacher ratios for the years 1980-1984, inclusive, and percent repeaters in each of the grades of the first and second levels of education for the years 1980, 1983, and 1984. The number of countries with values less than or equal the Cuban values in these distributions are reported in the form of proportions in the figures; years are represented by chronologically-consecutive columns; countries are grouped by continent. To conduct internal reliability checks we used information on indicators of Cuban formal education published in the Cuban mass media, particularly Mr. Castro’s speeches. We also used first-hand published and unpublished accounts such as the educational experiences of some of the authors’ acquaintances, an in-depth interview of a defecting journalist from Cuba’s Prensa Latina who specialized in educational matters, other documentary qualitative information on educational practices, and mass campaigns that occur in Cuba. The internal reliability checks compare 1969-1988 UNESCO educational information on Cuba with information presented in Cuban official accounts of the educational system published in Granma, Bohemia, and Juventud Rebelde during 1968-1992 and in radio, television, and other mass media sources collected by the Foreign Broadcast Information Service (FBIS), U.S. Joint Publications Research Service (JPRS) and the U.S. Information Agency’s Quarterly Situation Report on Cuba. We stress that the analysis presented in this essay does not ascertain the validity of Cuban educational statistics. It does not answer the question of whether there have been improvements in the quality of formal education. Such an analysis would require very different information and arguments from the ones presented here (e.g. Carnoy 1981; Badía 1993). Pre-primary education begins for Cuban children when they are 5 years old. Education for 6 to 11 year-olds is mandatory. The first six grades, corresponding to ages 6 through 11, inclusive, make up the first level of formal education. Before 1977 first level education encompassed seven years of schooling. The second level of education is composed of six grades divided into two three-years stages. It corresponds to ages 12 through 17, inclusive. Third level education corresponds to college, university and technical training (Leiner 1981 and Epstein 1988). 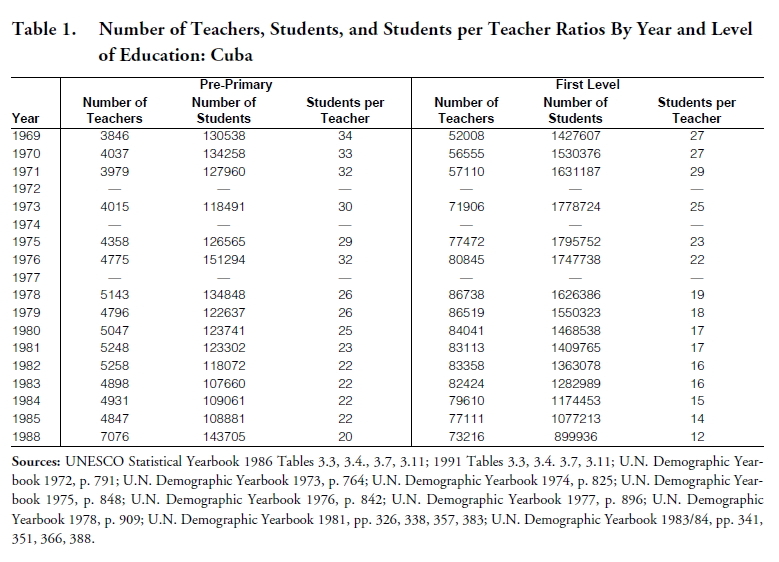 Table 1 presents UNESCO educational information on Cuba’s number of teachers, students, and students-per-teacher ratios (STR) for all levels of education for the years 1969-1988, inclusive. 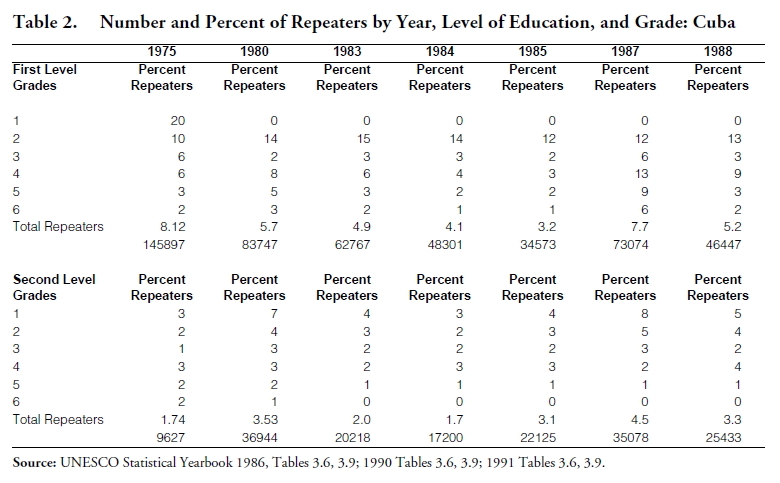 Table 2 includes Cuba’s percent of grade repeaters by level of education and grade for the years 1975, 1980, 1983, 1984, 1985, 1987 and 1988. These are the most recent years for which these statistics are available. Internal reliability checks show that UNESCO’s statistics in Table 1 are comparable to educational statistics published elsewhere in Cuba. To wit: Granma (JPRS #76724, 20 September 1980) gives student enrollment figures in thousands similar to the figures in Table 1 for the 1975-76 and 1979-80 school years, respectively. It shows, for pre-school, 126.6 and 122.6; for primary, 1795.8 and 1550.3; for intermediate, 604 and 1150.3; for advanced, 84 and 200.2; for a total of 3244.4 and 3452.9 for the two years. Likewise, Gil Green (1983:96), writing in the early 1980s, reports a students-per-teacher ratio of 13 for the first and second levels combined. Marvin Leiner (p. 42) reports that “at the start of the 198081 school year, Fidel Castro announced that Cuba had close to 213,000 teachers and professors,” with 90,000 in the primary schools, 80,000 in the secondary schools, 5,000 in special education, about 24,000 in adult education and nearly 11,000 in university centers. Bohemia (JPRS #82231, 15 November 1982) places the number of students at the beginning of the 1982-83 school year at 3,393,800 (1,355,500 in primary schools; 1,152,000 in intermediate grades; 270,000 in technical and trade schools, and 93,000 in pedagogy and education). L. Margulis and T.H. Kunz (1984, p. 638) place total university enrollment in 1983-84 at about 200,000 students. There are very few published reports by independent observers which could be used to provide external reliability checks. Lois Mickey (1977) visited a primary school in the Alamar area of Havana. She reported a student enrollment of 969 and a teaching staff of 38, for a student-per-teacher ratio of 25.5. This ratio for this school is a little bit higher than the first level national average ratios of 22 and 19 shown in Table 1 for 1976 and 1978, respectively, the two years for which information is available nearest to 1977. Nevertheless, while UNESCO does not provide information on the variance in the distribution of education al scores which would allow us to estimate the relative statistical significance of the deviation of this school’s score from the national mean, it does not seem to depart much from the national average. Table 1 shows the growth in the numbers of students and teachers during 1969-1988. It documents the enormous efforts of the revolutionary state in making good its promise of educating the nation (similar results obtain when the percentages of age cohorts attending schools are examined). Important differences have occurred since 1959 in the student enrollment patterns at each level of education. The number of students in pre-primary and first level education declined during most of the years under study. The decline reflects the combined effects of cohort aging and the well-known declines in Cuban fertility since the mid 1960s to the present. There were 130,538 pre-primary students in 1969 and 108,881 in 1985; in the first level the corresponding enrollment figures were 1,427,607 in 1969 and 899,936 in 1988. During this time, enrollment shifted dramatically to the second and third levels of education. 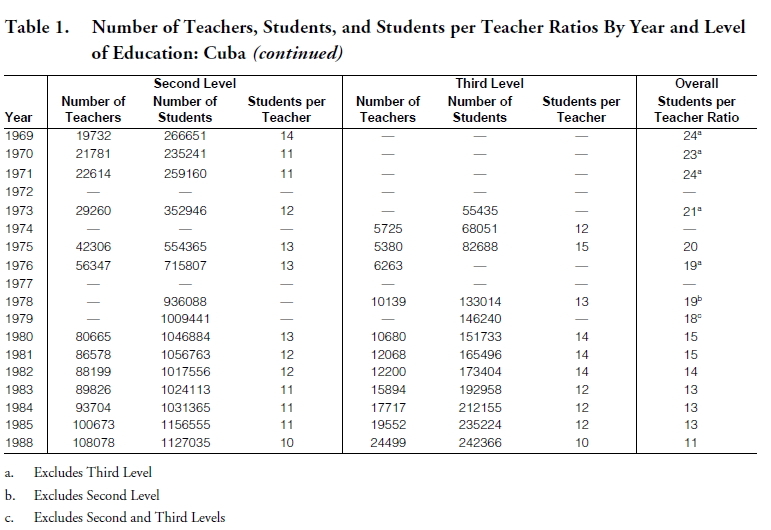 Table 1 also presents Cuba’s students-per-teacher ratios (STR). Independent confirmation for some of these students-per-teacher ratios and numbers is available (see coverage in Granma September 5, 1980; Bohemia September 3, 15; November, 1982; Leiner 1982, p. 42; Green 1983, p. 96; Margulis and Kunz 1984, p. 638). The shifts in student enrollments already alluded to occur in the presence of near-monotonic declines in the students per teacher ratios at every level of education. The near-uniform declines in these ratios suggests a high level of bureaucratic resources and responsiveness, for manpower and other resources had to be reallocated to match uneven increases during these years in student enrollments in different grades. Nevertheless, we can not observe temporary increases in the second and third levels ratios, particularly around the years of inflection of the shift in students enrollment. Similarly, there are no increases in the ratios during the late seventies and eighties at the pre-primary and first levels of education. At almost every level of education the students per teacher ratios have declined significantly during 1969-88. For pre-primary education the ratios decreased from 34 to 20; for primary education they declined for 27 to 12; the ratios for second level education dropped from 14 to 10. The total national ratio of 13 for the 1983-85 school years is quite low in terms of Cuban historical patterns. However, even this very low ratio is surpassed by the statistics announced at the beginning of the 1987-88 school year; close to three million students and 270,000 teachers, for a ratio of 11 (see coverage in Granma, September 13, 1987). It is clear from the secular trends in these national statistics, however, that the 1969 and 1970 third level ratios of 7 and 6 (excluded from Table 1) are incorrect. They are also unsupported by international comparisons (see below). The successes of Cuban education in lowering students per teacher ratios become even more impressive when compared to analogous statistics from other countries (Castro 1990b). The annual positions of Cuba in the pre-primary educational level distributions of this ratio are shown in Figure 1 (as mentioned earlier in this and subsequent figures, the heights of the columns represent the proportions of countries in each of the five continents with values lower than or equal to the Cuban values, for every year for which information is available). Cuba’s position in the world improved. In 1980, 62 percent of the 87 countries for which there was information had lower students per teacher ratios at the pre-primary educational level of education. By 1984 only 38 percent of the 49 countries with available information surpassed Cuba in this index. Moreover, there are important differences by continent. Most European countries had lower ratios than Cuba and Cuba fared well when compared to other American countries. These results do not challenge the reliability of the Cuban data. 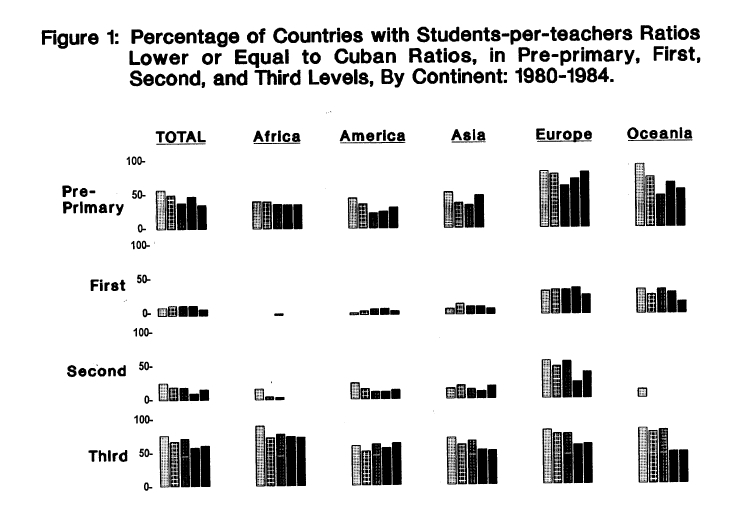 Figure 1 also shows the international comparative positions of Cuba in the first-level educational level distributions of students per teacher ratios. Cuba’s accomplishments in this level are obvious, reflected in proportions varying from .10 to .15 during 1980-84. Very few countries in Africa, America, and Asia match Cuba’s low students per teacher ratios. As expected, Cuba’s positions drop when compared with European countries, ranging from .38 to .30. Similar results obtain for the second level (general) education distributions of students per teacher ratios. As shown in Figure 1, Cuba’s worldwide position in this level improved during 1980-84 from .28 to .17. Except for European countries, very few African, American, Asian, and Oceanian countries could match or surpass Cuba’s ratios. Even compared with Europe, Cuba’s position improved from .62 to .43. To summarize the results so far, the Cuban studentsper-teacher ratios in the pre-primary, first, and second levels of education do not make us question the reliability of Cuban education statistics. Cuba’s achievement in higher education is less noticeable. Eighty one percent of the 90 countries for which information was available equaled or surpassed Cuba’s ratio of 14 (third educational level) in 1980. By 1984 this ranking had improved somewhat, for only 64 percent of the countries in the world had equal or lower ratios than Cuba’s 12. Nevertheless, it is still the case that most of the countries in the five continents equal or surpass Cuba’s students-perteacher ratios. These findings discredit Cuba’s reported ratios of 7 and 6 for 1969 and 1970 previously discussed. The drop in class size after 1958 occurred as the educational system employed as elementary and secondary school teachers, particularly during its first 25 years, individuals who had no teaching training (Castro 1992b). Early on the government began a teachers’ aide movement to help solve the shortage of instructors, specially at the university level, caused by the exodus of professional staff. These teaching aides were university students who had the approval of their teachers and the Federation of University Students (FEU) as well as appropriate knowledge of Marxism-Leninism, physics, and mathematics. They worked with professors, prepared laboratory classes, and helped with grading and lower level teaching. Acknowledging such practices, G. Jiménez (1982, p. 4) writes that thousands of students with a 10th grade education also taught classes. The low STRs shown in this paper are statistical outcomes affected by Cuba’s Ministry of Education. The Ministry often counts people twice, first as students and then as teachers. We do not know the extent of this practice, although it has been less common since the mid 1980s. Student-teachers were a very important resource to the state in its drive to make good its promise of universal education. A drawback to this policy is that, as is typical of other Latin American educational systems, from the very beginning of the revolution to the present one of the most often-mentioned educational problems in Cuba has been the lack of sufficient numbers of well-trained teachers. For example, Paulston (1971a, p. 452; see also Paulston 1971b; 1972) mentioned the lack of training of teachers: “nearly one-half of the 47,690 primary teachers in 1968 were ’maestros populares’ with minimal training.” Thirteen years later this chronic problem is illustrated in an article in Juventud Rebelde (June 9, 1981) about the problems of beginning teachers. The interviewees were experienced teachers. One respondent said that the Union of Communist Youth (UJC) needed to involve itself more deeply with beginning teachers to help them improve their methodological skills. Another respondent complained that several young teachers showed no interest in methodological training and that their lack of aptitude showed that they did not want to be teachers. The respondents opined that young teachers lacked sufficient time at their assigned Technical Teacher Guidance Program. They were hurried through their training. The respondent expressed their concern about the lack of textbooks, other necessary books, chalk, blackboards, and chemical reagents. Officials at the highest level of the Cuban government, like Mr. Belarmino Castilla Mas, former Minister of Education during the 1960s, repeatedly voiced concern over the poor professional preparation of teachers as well as a host of other problems: too many young and inexperienced teachers, an inadequate supply of professionally trained teachers in part due to the insufficient number and quality of in service training programs for nonprofessional and nongraduate teachers, slow pace in the construction and adaptations of buildings for schools, lack of furniture, instruction material, textbook, school supplies, and laboratory and workshop equipment, insufficient care of educational equipment and property, shortcomings in the organization and control by the Ministry of Education and its provincial offices, deficiencies in study plans and programs, lack of close school and community relations, student absenteeism, especially for youngsters 13 to 16 years old, low academic performance of students, and sizeable numbers of students repeating courses. Years later, as revealed by Mr. José Ramón Fernández, Minister of Education during most of the decade of the 1980s, many of these problems continued to plague the educational institutions (see discussion of these problems in Havana Domestic Service in Spanish February 1980, p. 87; and Granma, July 5, 1981, pp. 14-17; April 3, 1981, p. 31; April 24, 1988). Another indication of the low educational level of some categories of teachers in Cuba is that during the 1978-79 school year 42,000 primary school teachers graduated from “practicing teachers” programs offered to persons with very few years of formal education. That year 25,700 teachers graduated from more advanced training programs in pedagogical schools, although until then entrance requirements to these programs had been less than a ninth grade of education (Granma September 5, 1980). The report to the Fifth National Congress of Education and Science Teachers (Bohemia September 10, 1982; Trabajadores June 24, 1981: 38), based on extensive nationwide meetings of science teachers, also assigned primary importance to the need to raise the quality of education and pedagogical skills of teachers and professors through conferences, seminars, work-shops; the need to increase the level of teachers’ activism; the need to emphasize scientific research in higher education; and the need to discover the reason of low promotion rates and rejection of many students in the basic sciences (mathematics, physics, chemistry). Reflecting on these underlying difficulties Maurice R. Berube (1985) writes, partly based on interviews he obtained from officials of Cuba’s Ministry of Education, that the need to improve teacher quality and the scarcity of school supplies were two paramount problems of Cuban education in the early 1980s. In sum, Cuba’s success in lowering student per teacher ratios at the pre-university levels is in part the result of deliberate, officially-designed transformations of the educational system which for many years allowed students and others without technical or advanced educational degrees to teach, the accounting procedure used by the Ministry of Education and more generally, the redefinition of the profession of teacher at the pre-university levels. These patterns are important to understand events during the last three decades. They are being superseded rapidly. Greater educational standards for pre-university teachers are being put in place. Mr. Castro (1992b), in a recent address to the Teachers Conference 30 May, announced the stiffening of teaching credentials for primary school teachers. And as we have shown, it should be underscored that in international comparative terms the same successes in lowering students per teacher ratios have not occurred at the third level of formal education. Relatively higher teaching standards have been kept at this level. In light of this situation in which many students repeated grades or dropped from school, the low percents of students repeating their grades less than a decade later is in some cases striking. Incredibly, at least since 1980 there are no first grade repeaters in Cuba. In 1975 20 percent of the 305,278 first graders were repeating the grade. However, only five years later there were no repeaters among the 205,595 first graders throughout the island. This pattern contin ued during the 1980s. 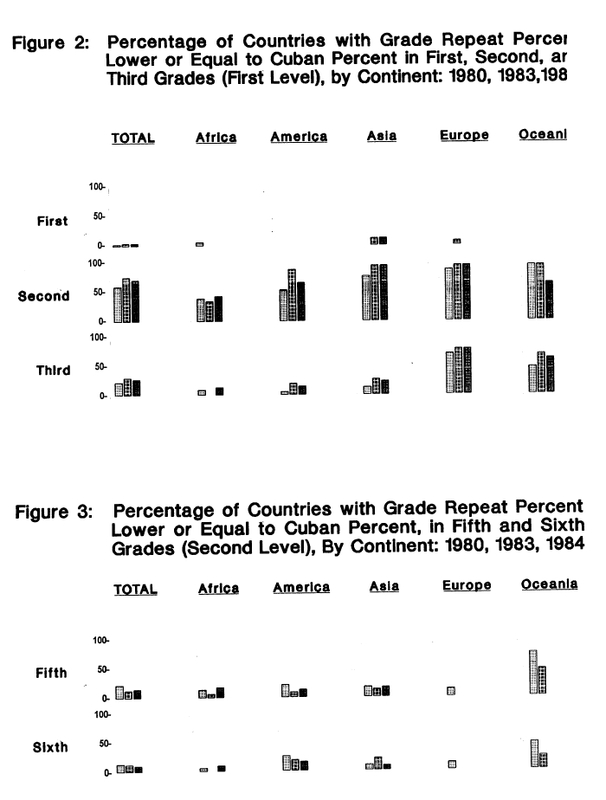 Figure 2 presents, for the years 1980, 1983, and 1984, the proportions of countries with percents of grade repeaters in the first grade (first level) lower than or equal to Cuba. In 1983 there was only one country in Europe presumably like Cuba, with no repeaters in the first grade and there were no European countries with this score in 1980 and 1984. Cuba’s reported absence of grade repeaters in the first grade was almost unrivaled in the other continents as well. In our opinion, these results can only obtain if the Cuban statistics are mistaken or, as it is most likely, if a national educational policy prohibits repeating the first grade irrespective of the students’ readiness to advance to the second grade. Relatedly, this pattern is not reflected in most of the other grades, where Cuba occupies more modest positions in the distributions of countries. There has not been a continued nationwide mass mobilization that would make these claims even remotely plausible. In contrast to the first grade (first level), Cuba’s ranking during 1980, 1983, and 1984 among the countries of the world in the percent of repeaters in the second grade (first level) are much more modest. Figure 2 shows that almost all countries in Europe had equal or lower scores, and this is generally true also of the countries in the other continents, except for African countries. Cuba’s international position in the third grade (first level) distributions is both advantageous and credible. As shown in Figure 2 most African, American, and Asian countries have higher percents of repeaters in the third grade than Cuba, while most European countries surpass Cuba in this index. While lack of space prevents the detailed presentation of the international statistical comparisons for the fourth, fifth, and sixth grades of the first level of education, the pattern appears reliable. In each of these grades Cuba’s position improved during 198084 both in comparison with the world and with most continents. Similarly, the comparative analysis of grades one through four in level 2 indicates a respectable and believable level of achievement. For example, in 1984 only 34 percent of the countries of the world had values lower than or equal to Cuba’s three percent repeaters in the first grade (second level). There were important variations by continent, so that, as predicted, Cuba fared much worse when compared to European countries and much better when compared to Asian and African countries. This general pattern of findings hold for grades two, three and four of the second level of education. By way of contrast, the findings shown in Table 2 for grades 5 and 6 of level 2 (the eleventh and twelve grade in Cuba) do not conform with existing knowledge of Cuban education. The claim that there has not been grade repeaters in the twelve grade since 1983 is not credible. These claims are unsupported by what is known about Cuba’s formal educational system and by international comparisons. In terms of internal criterion, it is reasonable to expect a positive correlation between the percent of student dropouts and the percent of students repeating the grade. Indeed, there is evidence that most of the dropout problem in Cuba occurs in these two grades. For instance, during the 1980-81 school year 21 percent of youngsters 13 to 16 years of age nationwide were not attending school. Berube (1985; see also Sendón-Oreiro 1983) estimates that 97 percent of eligible elementary school students attend school, 93 percent graduate, and that the dropout problem occurs in the intermediate school years. He estimates that 27 percent of students sixteen years old drop out of school. Our point is that the opposite patterns would have to occur to justify UNESCO’s reported proportions of grade repeaters in these grades. The relative position of Cuba in the distributions of country values also do not support the reliability of these Cuban statistics. As shown, Cuba’s relative position in the eleventh grade (fifth level, Figure 3) is unbelievably low. In 1984 only 15 percent of the countries of the world and none of the countries from Europe and Oceania equaled or surpassed Cuba’s value in this index (one percent). By way of contrast, greater percents of the countries from Africa, America, and Asia equaled or surpassed the Cuban value. These patterns are contrary to what could be reasonably expected and put into question the reliability of the Cuban figures. An even more extreme case occurs in the 12th grade (Sixth level, Figure 3). There are no European and Oceanian countries with values equal to Cuba’s zero percent of repeaters. We do not believe the accuracy of these statistics, for they cannot be accounted for despite the efforts by Cuban educators to provide alternative educational programs in technical and vocational fields for grade repeaters (so that they would not be counted as repeaters). The very low proportions of grade repeaters in Cuba is in large part the result of the ideologically-generated social pressures on teachers to promote students at the pre-university levels. Reminiscent of the grade inflationary practices in the United States, grade promotion at these levels is an important goal of the Cuban educational system. The criterion is used to gauge the success of teachers and administrators; presumably good teachers have very high percentages of promoted students in their classes. Teachers’ ability to promote their students affects their career advances, prestige and standing in the teaching profession. According to Cuba’s former Minister of Education Mr. Fernández (Havana Domestic Service in Spanish February 1980, p. 87), the promotion of students is a “fundamental indicator” of teaching efficiency. Mr. Fernández stressed “top promotion with top quality,” in itself an admirable goal. However, given the vulnerability of Cuban citizens to the claims of the state and its mass organizations and organs of social control (Aguirre, 1984), the goal translates as pressure on teachers to advance their careers by having impressive promotion rates in their classes. Aggregated nationwide, this pressure is in part responsible for the low percent of grade repeaters. Marvin Leiner (1981) underscores the importance of student promotion, both on the quarterly and finals exams, for school administrators. Teachers who fail unusually high percent of their students must justify their grading decisions to the director of their school. Their grading decisions, and the students impacted by them, are the focus of investigation by the director, other teachers in the school, and student members of the FEEM in the school. Students contesting their failing grades can request from the school director to retake the exams. Such exams exclude the teachers involved in failing the students and may circumvent their decisions to fail the students entirely. The emphasis on grade promotion reflects an interest on the part of educational policy planners in late “bloomers.” It is a policy which embodies the optimistic view of human nature in classical Marxism, values cooperativeness and mutual help among students, and deemphasizes competition (Allen 1974, p. 52). It is also a principle of educational organization very open to abuse, especially in the absence of independent teachers’ professional associations in Cuba which would protect teachers from social pressures to promote students. It becomes easier to measure the percentage of students promoted out of their grades than the quality of their intellect, and in a system which is so highly centralized and bureaucratized, numbers and statistical “proofs” carry the day. The absence of teachers’ professional associations is paired with the predominance of the state bureaucracy and its central planning. In Cuba public education is the only system of formal education available. The national state is the only employer. Workers in the institution of education are grouped by the Cuban state into a syndicate. Their syndicate is not a mechanism of interest politics but is instead part of the socialist state. It has direct representation in and direction from the Central Committee (CC) of the Cuban Communist Party (CCP), as part of its Education, Science, Culture, and Sports directorate. Educational workers’ initiatives to change educational practices must first receive recognition and approval from school directors. Typically, at the pre-university level the director very often must make these decisions with the input and agreement of the CCP member of the staff assigned to represent the CCP in the school and the school’ student leaders who are members of the Federation of Middle Level Students. Workers’ initiatives that pass this first screening, are then referred to the municipal office of the Ministry of Education, which also must approve the initiative or change it to conform to established policy. If the initiative successfully passes this second screening it is then referred to the Ministry of Education for evaluation. In turn, if it passes this third screening, it is referred by the Ministry to the CC for evaluation and possible approval. Alternatively, the Ministry can advise its Municipal office to present the initiatives to its municipal representatives to the next national congress of educational workers. If the initiative secures the agreement of the municipal representatives to the congress, it is then discussed in the congress and evaluated at the national level. In turn, if the initiative becomes part of the final set of recommendations of the congress, it is then evaluated by the CC and may become official educational policy. We give this involved explanation of institutional dynamics to show that the closeness of the political and educational institutions of Cuban society and the overwhelming predominance of the former means that only a very narrow range of local level initiatives to change educational practices ever succeed in becoming policy. These successful claims must “fit” in some fashion within the larger plans of the government before they become policy. Some topics of importance to the teaching profession, such as improvements in teachers’ salary, work hours and conditions of work are clearly outside the range of ’appropriate’ locally-generated topics of policy discussion. Instead, they may be part of the national development plan devised and executed by the state. A recent episode illustrates the vulnerabilities of the teaching profession as it tries to maximize both promotion and merit (see coverage in Granma January 15, 22, 24, 31; February 1, 5, 26; and March 5, 11, 20, 1985). A 1985-1987 mass campaign to improve educational equality in Cuba generated political pressure on teachers, dramatically decreased grade promotion rates, and was eventually repudiated by the government. In 1985, Mr. Fernández complained about the work of school administrators and called attention to the problem of educational quality and the need to improve teaching methods, testing practices, self-study, and analytical thinking by teachers (Granma February 1, 1985, p. 1). In a speech to a Seminar of Higher Education, Mr. Fernández mentioned the need for improvements in disciplinary and educational methods and teachers’ skills (Granma June 8, 1985). He emphasized “quality teaching,” and the value of learning how to teach rather than meeting a numerical goal for the sake of a number, i.e., promoting students to meet a quota (Granma September 28, October 3, 8, 1985; Bohemia October, 1985). The campaign on teacher quality continued in 1986 (Richmond 1987). School administrators were urged to visit classes more frequently to detect problems and evaluate teachers (see Juventud Rebelde February 19, 25, 1986; Granma February 24, 1986, p. 1). Teachers’ deficiencies, such as insufficient knowledge of subject matter, preparing simplified study material, reliance on old notes rather than on newer texts, and low standards for promoting students were discussed (Juventud Rebelde February 19, 25, 1986; Granma February 24, 1986). In April the Ministry of Education announced the creation of a central committee and a special task force attached to the Central Institute for Pedagogical Sciences. Its task was to look at the problem of quality in educational instruction and standards and at the appropriateness of school plans and programs, all in an attempt to improve the skills of teachers and reduce their bureaucratic burdens (Granma April 12, 1986, p. 2). A significant nationwide decline in the rates of grade promotion followed. The decline in the number of students promoted was most pronounced in urban centers, and at the high school and pre-university levels, as reflected in the following promotion percents for the 1984-85 and 1985-86 school years, respectively: primary 96.7 and 95.4; basic secondary 94.9 and 81.4; pre-university 93.3 and 83.1; technical professional 95.9 and 89.3; teachers’ schools 96.7 and 92.7; total, all levels 96.1 and 90.5 (Granma August 4, 1986, pp. 1, 3) Some of the most important drops in promotion rates at the basic secondary level occurred in the cities of Havana (65.6 percent promoted), Cienfuegos (77.8 percent), Santiago de Cuba (80), and Villa Clara (80), and in the provinces of Havana (70), Santiago de Cuba (71) and Guantánamo (73). On July 25 the Ministry of Education reacted to the nationwide decline in grade promotion rates by announcing that it was holding month-long makeup summer school sessions, to be followed by special exams during the last week in August (the special exams have become routine; during the two-semester school year there are two exams and a final exam, and if the final exam is not passed the student must pass a make-up exam to be promoted to the next grade) (Granma March 30, April 6, 8, 1987) The special exams were an attempt to improve the grade promotion rates. Mass, professional, party, party-affiliated organizations, and parents, were mobilized to try to ensure that the students who had not passed their exam would attend the special summer school session and study to successfully pass them. The results of this nationwide remedial summer school and special exam effort were not announced. There is only information on one school, the Republica Argentina Democrática Popular; 83 of its students had to take the make-up exam in mathematics, 39 students took it, and 19 passed it. The results in the other exams were equally inauspicious (Radio Rebelde August 25, 1986, PM Broadcast). The decline in the rates of grade promotion continued during the 1986-1987 school year. There is information for the City of Havana. During the first semester of the 1986-1987 school year 75 percent of the City of Havana’s 96,000 basic secondary students failed the first round of testing, and 39 percent failed the make-up exams. More than 35,000, or about a third of the total student population of the city, had failed one or more courses in the first semester. Of these failing students 15,860 were already repeating the same grade (Granma March 30, p. 3, April 6, 1987, p. 4). This episode was the first collective campaign for the system-wide enforcement of quality standards in the non-university grades. The effort was short-lived. As part of the society-wide rectification campaign begun in 1987 (Díaz-Briquets 1993), the government reverted to the universalist vision of education explicit in its political ideology, denouncing the idea that there was any connection between the toughness of exams and the quality of education. While disclaiming that the new changes were a manifestation of “facilismo” (easy methods), the government lowered, for all educational levels excluding university courses, the minimum passing scores in the exams from 70 (the passing score used since 1962) to 60. It also eliminated the final exams in several academic subjects (Granma June 8, 22, 1987). It is instructive to observe the reactions of the teachers. The 1986 Third Party Congress and 1987 Fifth Congress of the Union of Communist Youth (UJC) repeated the messages of the government’s mass campaign about the poor quality of teaching (see Granma December 1, 2, 1986; April 4, 6, 1987; Habana Tele-Rebelde December 1, 1986). Teachers participating in the Sixth Congress of the National Syndicate of Workers in Education, Science, and Sports had a different interpretation of the origins of the crisis. The national congress of teachers, held on November 21-22, 1986, convened 451 delegates. During the congress, some of the participants repudiated the accusations that teachers were responsible for the problems besieging the educational system. In a telling response, one of the delegates pointed to the official pressures teachers had felt in years past. He pointed out that, the use of easy teaching devices became the reigning method many years ago, and one of its most serious manifestation was promotionism…At the beginning educational policy was incorrectly understood. It was believed that the quality of a teacher’s work was demonstrated in the rate of promotion of his students…(and) teachers were demanded to promote more students each year. Teachers did not agree with this and said that it was wrong, but they were not listened to…It was not the teachers who started the race for promotionism (Granma November 22, 1986, pp. 1-2; see also Granma November 20, 24, 1986). The educational practices documented so far evidence the promotionist educational practices in Cuba. The foregoing material also documents that these practices had the unintended effect of lowering educational standards in the non university grades. Perhaps as a way to minimize the negative effects of the lowering of educational standards there has also been a seemingly paradoxical emphasis on educational qualifications and letter grades. Meritocratic achievement is, together with “ideologically-correct” background, the paramount criterion used in Cuba to select those who go on for advanced educational training and who can hope to obtain high-quality education. In fact different educational tracks are used. Marvin Leiner (1981, p. 212) documents the importance of test results for students, their teachers, and their schools. Letter grades are very important for students: “starting especially in grade 5.entrance to the university is determined by scholastic average (Leiner).” Much stress is placed on grades, and only students with the best cumulative grade point average and the appropriate ideological attitude can hope to receive and complete the rigorous university training (e.g., Mickey 1977; Carty 1978). Contrary to what is the case in the lower educational levels, at the highest levels of education grade promotionism is at a minimum. High proportions of university students do not complete their careers. For example, among medical students the dropout rate is close to 50 percent, and in the 1981-82 school year only 48 percent of university students scheduled for completing their university degrees in fact completed them (Carty 1978; Mujal-León 1988, p. 30). The hoped-for radicalization did not take place. Years later M. Pastor (1983; see also Carnoy 1981: 10; Richmond 1990), among others, visited elite schools like the Lenin School in Havana, modeled after U.S.S.R. educational criteria and reputedly the best secondary school in the country, and commented on the emphasis on testing and grading of students. These schools epitomize the Soviet hierarchical model of bureaucratic organization that according to Harris (1992) violates socialist principles of bureaucratic organization. The de facto contradiction between merit and promotion coexists with the centralization of Cuban education and the autonomy of the educational bureaucracy from pressures from parents and students. Paralleling the centralization of the economy and the absence of independent organizations and individual civil rights, the educational system is highly centralized in the Ministry of Education, which sets national educational policy (Berube 1985). Even though parents and students provide a lot of support to school administrators and teachers, they do not have access to the decision-making process, nor can they influence school policy. Parents who are members of school councils cannot criticize the teachers or the instructions they give their children. Mr. Abel Prieto, a high official of the Cuban Ministry of Education, said it most succinctly: parents “cannot tell the teacher that he or she is not doing a good job because it is assumed that the parent knows less about it than the teacher” (Martuza 1981, p. 266). Instead, they can ask the educational inspectors of the Ministry of Education for an inspection of the classrooms. The rights of the educational bureaucracy are stated in law. The body of laws governing students and the educational system is extensive (Granma March 14,1980; Havana Domestic Service March 14, 1980) and directed to make the institution of education immune to outside pressures. Thus, for example, on March 14, 1980, Cuba’s State Council approved a law on student discipline which abolished the right of students to appeal to courts in cases of disciplinary violations. Henceforward, the treatment of disciplinary cases became an entirely internal procedure (Havana Domestic Service March 14, 1980: 42). People participate in the educational system within the limits and by the rules imposed by the bureaucracy. The government, primarily through its mass organizations, tries very hard to encourage adult continuing education and to train dropouts. Similarly, it provides educational opportunities to military personnel and veterans, and spends considerable resources in increasing the average educational level of the population. In spite of these encouragements, however, at least in two respects the educational institution is a closed system. The concern of parents and the special interests of the local citizenry do not affect tightly centralized educational planning, program, and training. Meetings are held and parents participate, but their involvement is in support of the official vision of education. Moreover, advanced educational training continues to be restricted on the basis of letter grades, other indicators of achievement, and the right ideological identity. In summary, as is also true for other national educational systems, the very high rates of grade promotion in Cuba are to an important albeit unmeasured extent directly affected by the political climate in which teachers teach, and by the fluctuating pressures on teachers now to pass students, later to improve quality and educational rigor. The inability to maintain high quality standards throughout the educational system strengthens the traditional emphasis on merit and the subsequent uneven application of promotionism in the Cuban educational system. The foregoing analysis shows one general inconsistency worth commenting upon. On the one hand, our tests, limited as they are, nevertheless show that most of the official statistics reported by UNESCO about Cuba are reliable. They give no grounds to challenge the often-repeated claim that the Cuban government has tried very hard to encourage the education of the Cuban people. On the other, however, some official statistics are plainly unreliable and invalid. We have identified these scores and shown the reasons for our incredulity. The puzzle for us is why such systematic errors become part of an otherwise reliable statistical record. The unreliable statistics can not be explained by assuming that they are the results of accidents, coding mishaps, or other data management problems. Instead, in our opinion they are the result of a generalized tendency to exaggerate real revolutionary achievements to such an implausible extent that in the long term results in the erroneous discredit by outsiders of the entire government effort. This is the paradoxical result of the presence of two distinct and opposed principles of power: rationality and charisma. The first builds the bureaucracy and the programs and practices which produce the achievements; the second, unbounded by principles of logic and human limits, claims the most amazing feats as its own and demand their ’proofs.’ Our prediction is that this postulated commingling of rationality and charisma will help social scientists understand the workings of other social institutions in the island. Aguirre, B. E. 1984. “The Conventionalization of Collective Behavior in Cuba.” American Journal of Sociology 90: 541-566. Allen, Garland E. 1974. “Education in Revolutionary Cuba.” The Education Digest (October): 5154. Badía, Arnhilda, editora. La Educación en Cuba: Pasado, Presente y Futuro. Washington, D.C.: The Endowment for Cuban American Studies, Cuban American National Foundation. Berube, Maurice R. 1985. “Assessing a Revolution.”Commonwealth 112 (September 6):460-464. Bowles, Samuel. 1971. “Cuban Education and the Revolutionary Ideology.” Harvard Educational Review 41 (November): 472-500. Carnoy, Martin. 1981. “Educational Reform and Economic Development in Cuba: Recent Developments.” Unpublished manuscript. Carty, James W. Jr. 1978. “Communist Ideology Basic to J-Education in Cuba.” Journalism Educator 33 (3): 4043. Castro, Fidel. 1992b. “Castro Addresses Teachers Conference 30 May.” FBIS–LAT–92–109, June 5: 6-18. Castro, Fidel. 1990b. “Castro Makes Closing Remarks at FEU Meeting.” FBIS-LAT–90–045, March 7: 3-8. Díaz-Briquets, Sergio. 1993. “Collision Course: Labor Force and Educational Trends in Cuba.” Cuban Studies 23. Epstein, Erwin. 1988. “Cuba.” Pp. 262-274, in World Education Encyclopedia. New York, New York: Facts on File Publications. Green, Gil. 1983. Cuba, the Continuing Revolution. New York, International Publishers. Kirk, editors, Cuba in Transition: Crisis and Transformation. Boulder: Westview Press. Hollander, Paul. 1982. “Research on Marxist Societies: The Relationship Between Theory and Practice.” Annual Review of Sociology 8: 319-351. Jiménez, Georgina. 1982. “The Selection, Training of Internationalist Teachers Noted.” Granma (26 November). Kahl, Joseph A. 1977. “Cuban Paradox: Stratified Equality.” Pp. 241-264, in Cuban Communism, edited by Irving L. Horowitz. New Brunswick: Transaction Books. Leiner, Marvin. 1981. “Two Decades of Educational Change in Cuba.” Journal of Reading 25(3): 202214. Leiner, Marvin. 1982. “Educational Change in Cuba.” The Education Digest 47 (May): 44-45. Luxenburg, Norman. 1984. “A Look at Castro’s Statistics.” Encounter 62 (3): 58-62. Margulis, Lynn and Thomas H. Kunz. 1984. “Glimpses of Biological Research and Education In Cuba.” BioScience 34 (November):634-35; 638-39. Martuza, Victor. 1981. “A Conversation with Abel Prieto.” Journal of Reading 25(3): 261-269. Mesa Lago, Carmelo. 1969. “Availability and Reliability of Statistics in Socialist Cuba.” Part I. Latin American Research Review 4:2 (Spring): 5391. Mickey, Lois. 1977. “Education in Cuba: An American Report.” Kappa Delta Pi Record 14 (October): 29. Mujal-León, Eusebio. 1988. The Cuban University Under the Revolution. Washington, D.C.: The Cuban American National Foundation. Paulston, Rolland G. 1971a. “Revolutionizing Educational Policy in Cuba.” School and Society 99 (November): 452-453. Paulston, Rolland G. 1971b. “Education.” Pp. 375397, in Revolutionary Change in Cuba, edited by Carmelo Mesa-Lago. Pittsburgh: University of Pittsburgh Press. Paulston, Rolland G. 1972. “Cultural Revitalization and Educational Change in Cuba.” Comparative Education Review 16 (October): 474-485. Pérez, Lisandro. 1984. “The Political Contexts of Cuban Population Censuses, 1899-1981.” Latin American Research Review 19:2, pp. 143-161. Richmond, Mark. 1990. “Revolution, Reform and Constant Improvement: 30 Years of Educational Change in Cuba.” Compare 20(2): 101-113. Sendón-Oreiro, Olga. 1983. “Problemas del Ausentismo Escolar en el Adolescente/Problems of School Absenteeism in Adolescents.” Boletín de Psicología Cuba 6(2): 44-54.